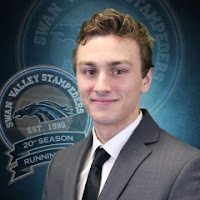 Josh Maucieri (1G 1A) and Dane Hirst (2A) notched two points each to lead the Swan Valley Stampeders to their 6th straight win as they defeated the Winkler Flyers 3-2 on home ice. Josh Tripp also scored, his 31st goal of the season for Swan who a 25 saves performance from Merek Pipes in the win. Colton Harder and Josh Kagan replied for the Flyers. The Melville Millionaires dropped their 4th straight on Saturday night after a 6-2 loss to the Estevan Bruins on home ice. Will Koop and TJ Irey had 2 goals each to lead the Bruins. Daniel Liberty had a 1G 1A while Ryan Butler had the other goal for the Mils who got a 27 save performance from Berk Berkeliev in the loss. The Mils and Terriers will meet next weekend for the next Highway 10 home and home starting next Friday in Melville. GX94 will broadcast the game with Yorkton Dodge Junior Hockey, "Sask Milk" pregame show begins at 7:20 pxp starts at 7:30 from the Horizon Credit Union Center. Yorkton dropped both games of their weekend road trip as after a 7-4 loss on Friday, the Terriers lost 4-1 on Saturday to the Kindersley Klippers. Caden Benson scored twice to lead the Klippers while Justen Close made 34 saves to earn the victory in the goal. Aiden Bulych scored the Terriers only goal, his 10th of the season while Ryan Ouellette stopped 30 shots in the loss.